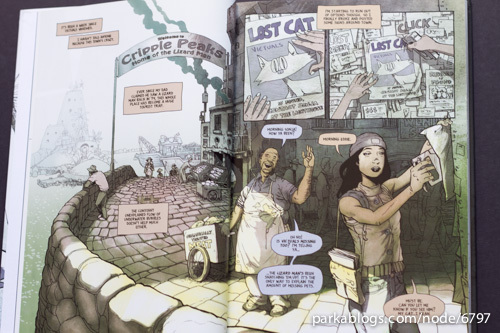 When I first came across Jason Brubaker's website, reMIND only had a few chapters. Now, it's a printed graphic novel available for sale. 152 pages, nicely bind. That was quick. And only 2500 copies are printed. The story starts with Sonja who lost her cat Victuals in a mysterious bubbling pool of water. Several days later, Victuals came back a talking cat. The story then explores what happened. It's a nice and unique story, an action adventure mixed with some surprises. The characters are interesting, not just Victuals but also the others which are introduced. 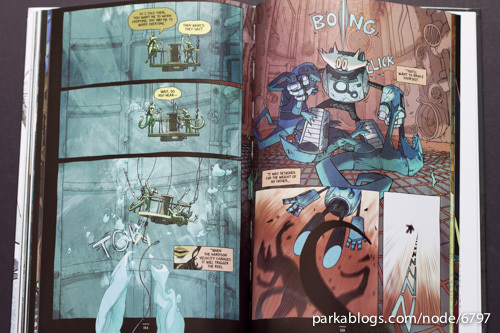 The art is beautiful with a textural feel that's a good match for the story. The composition is fantastic, panels carefully laid out with purpose and that really aids the storytelling. 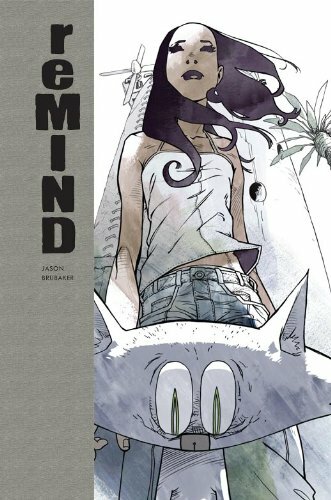 The book ends with an inspiring look at the process of making the graphic novel as an independent creator. 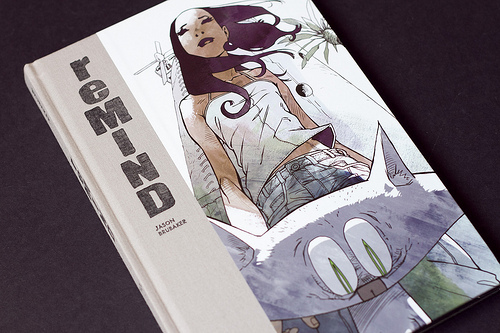 Also be sure to check out the reMIND website because there are lots of useful information there, like tips on creating graphic novels or promoting your web comic. While you can actually find the graphic novel available as a free web comic there, it's always cool to support artists who create good comics by getting a physical copy. 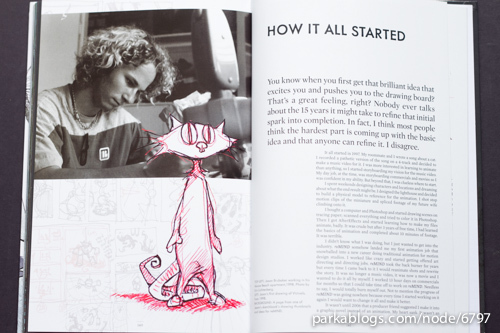 For those who have been following his work online, you'll probably get an extra sense of appreciation knowing how much effort this book represents. As always, great review Parka. Don't forget to emphasize to everyone that this book is in limited print and everyone who wants it, should order it now. I just ordered my copy and Amazon claims to only have 11 left in stock with no notice of ordering more. Got my copy from Amazon yesterday. Unfortunately, it was poorly packed so the corners and spine are dented (it was thrown into a box with no packing material). It seems like they struggle to safely pack book these days. Time to see if they'll send a better replacement copy. I hate it when they throw in books like that. You should send feedback on their packaging. They have a dedicated channel just for receiving feedback on packaging. You can see that when you're on your Orders page. Thanks. I went ahead and left feedback. A few years back, Amazon seemed to always shrink wrap the books to larger pieces of cardboard that fit snugly into the box, so that the book corners couldn't get damaged. I wish they'd stick with that method. I just feel bad when a limited print run item gets damaged (especially after reading about all the work the author of reMIND put into getting it independently published). Hopefully, Amazon can find another customer for this particular copy who isn't as picky about the condition of his items. Side question: How does one eliminate the "not verified" next to his user name? Had the same dent on the spine too, but at least the book's not crooked.